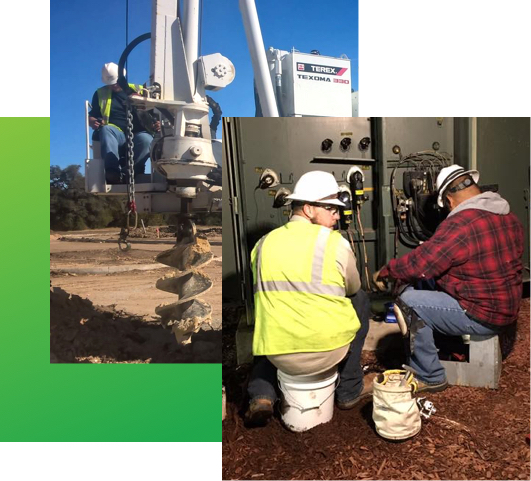 Greenstone Electrical Services provides trained and experienced crews to install electrical utilities for private and public companies. Let our Certified Journeyman Lineman/Crews provide you with reliable service. We are equipped with a full -fleet of construction equipment and vehicles ready to serve a wide range of installation projects and electrical needs. Greenstone’s construction crews are trained in OSHA safety, given daily job hazard analysis briefings, as well as practical training in health and safety, excavation and trenching, CPR/first aid, blood borne pathogens, hazard communications, emergency action, traffic control, fall protection, crane and ladder safety, lock/tagout, personal protective equipment, and fire safety. We are a Drug-Free Workplace, requiring pre-employment drug testing, post accident and random testing. All of our crews possess years of on-the-job experience. Not only that, they’re also industry certified and committed to keeping up with the latest advances in the field. © Copyright 2017, Greenstone Electrical Services, LLC.